Everything’s bigger in Texas…Including the monsters. Things look pretty crappy for Judah Black. Being forced to take an assignment in the middle of nowhere or risk losing her badge is hardly what she would call a perk of the job. 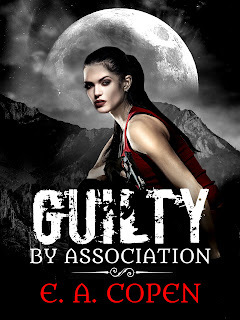 But when a young werewolf is murdered on the Paint Rock Supernatural Reservation, her day goes from bad to worse. Labeled as a drug deal gone wrong, local law enforcement passes the case off as solved. Judah knows better. An occult expert, she knows the look... the feel of magick. Despite the insistence of the authorities that the case is solved, Judah presses into the investigation but she wasn’t prepared to uncover a cunning, ancient enemy… one that proves irritated with her interference. 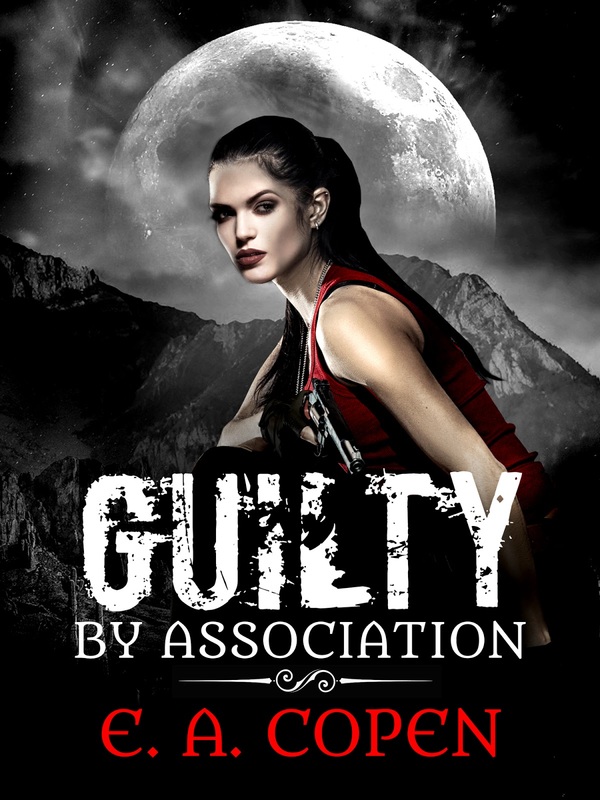 Guilty by Association is the bone-chilling first chapter of E.A. Copen’s Judah Black Series. Rife with paranormal mystery, this top-notch urban fantasy will have you turning pages! If you are a fan of Patricia Briggs' Mercy Thompson series, you won’t want to miss Judah Black! I'm a huge fan of urban fantasy novels, especially those with strong female leads. Lately I've had a hard time finding really good books, that don't start with a strong woman as main character that suddenly turns into a whimpering helpless girl as soon as the hero arrives. Judah Black was far from helpless as you can get. However she also isn't one of those cold, “Oh I'm so tough and nothing can hurt me” characters you often get, no Judah is a well rounded character with strengths and weaknesses that make her feel real. Judah is a BSI agent and newly assigned to Paint Rock, a reservation for everything supernatural. Of course, most locals regard the new arrival with dislike and suspicion, which means she has a hard time starting to work. Apart from being an agent, she is also a mother, which is refreshing in this genre. I can't remember the last time when I read an urban fantasy with a mother as main character. Hunter, her son is well written, E.A. Copen put a lot of thought into portraying him correctly. Many times kids in novels are written horribly, but here it wasn't the case. There are so many supporting characters in this novel, I have no idea where to start. There is Gideon Reed, who is a priest with a secret. Saloso Silvermoon (werewolf), Chanter Silvermoon (also werewolf, the alpha), Ed (computer geek and werewolf and my favorite character), Andre DeLuc (a mysterious guy with a secret), Robbie Fellows (one of the most fascinating characters I've read so far), Zoe, who is Saloso's ex-girlfriend... Gah, I really don't know where to start, they are all well written and I was constantly on the edge of my seat wondering who the bad guy is. In the end the villain was scary. I don't think I ever read a book with a villain quite like him. Villains hardly ever scare me, but he was a true monster. The world building was superb. The trope “supernaturals coming out in the open” was done before and the book had a bit of a True Blood feeling, but more of a “What if the vampires and other Supernaturals in True Blood had a harder time being accepted and forced to live in camps”-feeling. I had a hard time putting the down and can hardly wait for book 2 (which I see is due soon!). Raven Blackburn was born in South Africa. After spending her childhood with her loving grandparents she moved to Germany at the age of eleven to live with her mother, stepfather and little sis. She suspects moving halfway around the world at that exact age caused her letter to Hogwarts to go missing, something she deeply regrets. Ever since her childhood she would spend each days creating stories in her head and frantically writing them down lest she forget them all. Most of her stories feature vampires, so be advised to close your windows at night while reading.